VINTAGE JEWEL THIEVERY; HEY, THAT’S MY DESIGN! First off, for those of you who may be expecting to read a very good yarn about a big jewel heist, you’re about to be vastly and completely disappointed by this month’s Jewel Notes. The topic is actually not about theft of the jewels themselves, but about protection of the artistic designs and designers. Just the other day, I was writing descriptions for some pieces and one happened to be a lovely Hollycraft bracelet. I’m sure that most of us are familiar with the typical mark for this company, i.e. 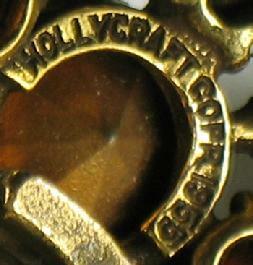 “HOLLYCRAFT COPR. 1954” or replace the date with any year during the 1950’s. Now for an admission of guilt: In my early days as a collector and dealer, my simple brain misread this mark as being “HOLLYCRAFT CORP. 1954” and I wrote many a description (and, thank goodness still made many a sale) with the incorrect listed mark. And, silly me, even once I realized my mistake, I still assumed that “Copr.” was an abbreviation for “Corporation”, albeit not the usual one. Well, as chance would have it, I also had a Trifari piece to list that same day and it was marked “TRIFARI COPR.” and that had me questioning my original assumption. I discovered through a brief search that “Copr.” was not a funky abbreviation for a corporation but was instead an abbreviation for “Copyright” equivalent to the well-known ©. A little further research found that “Copr.” is still considered today as a valid mark for designating a copyright. And that had me thinking about what copyright symbols mean when placed on our vintage costume jewelry pieces. 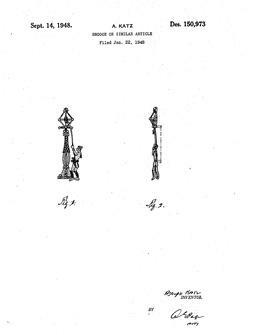 Originally, some costume jewelry manufacturers patented their designs. This certainly wasn’t the norm, and for those companies and designers that used this process, it was very time consuming and expensive. Imagine designing and then drawing and then describing and then filing and then paying a fee to apply for a patent for a single design. And then waiting to get the actual patent issued for the design. Ever wonder why pieces are almost always marked “Pat. Pend.” rather than being marked with the actual patent number? The reason is that the patent was typically issued long after the piece had been produced and run the course of its season. Yes, you can see the irony of this situation. This is one reason why most manufacturers didn’t bother with patents for their designs. Even major manufactures such as DeLizza & Elster, for example. D & E can certainly take the award not only for not filing for patents, but for not marking their jewelry at all. The rationale, per Frank DeLizza, was simple. Why bother with the expense of filing a patent when whoever wanted to rip off the designs was way ahead of the curve anyway? Why worry about it when new designs were typically brought to market every six months? So what the heck was my point? Oh yeah, I wanted to talk about “Jewel Thieves”, namely the 1955 decision in the case of Trifari, Krussman & Fishel, Inc. v. Charel Co. This lawsuit was brought by Trifari for copyright infringement involving a piece that was not patent protected, but had been marked with the copyright symbol. The decision was handed down in favor of Trifari, and the rationale of the judge was that costume jewelry may be “works of art” entitled to copyright protection. This was in spite of the defending attorney arguing that Trifari’s products were “junk jewelry”. I don’t think that we need to take a poll to see where we fall, as a group, on that question! One of the most interesting facts of this Trifari case is that their jewelry (at least some of it) was already being marked with the copyright symbol. My guess is that their legal advisors had decided that copyright protection likely would apply to costume jewelry, and were just waiting for a design copycat to test that theory in court. Proving in court that costume jewelry was afforded copyright protection was a huge victory for all designers and manufacturers in this area. 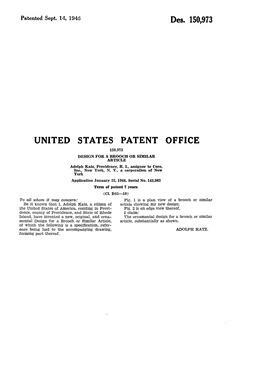 No longer was the only proactive option an expensive patent application, but a simple mark on the piece could suffice and, for extra protection, the piece could be filed with the copyright office. Even today the actual filing is not required in order for a work to be covered by copyright protection laws. However, then as now, actual filing does make a stronger case in court. As an interesting side note, unlike in the case of a patent application, for a copyright filing, it is not a drawing that is submitted, but instead an actual piece of jewelry was sent with the application. It boggles the mind to picture a huge room somewhere in Washington D.C., filled floor to ceiling with thousands of pieces of vintage costume jewelry that were submitted with copyright applications. Does this room exist? Wouldn’t it be fantastic if we could find it? Who’s game for this project? Now, let’s get to a secondary issue; the 1955 Trifari v. Charel case is sometimes said to be the turning point for marking costume jewelry with a © for protection, and that any piece with a copyright mark can be safely dated 1955 or after. Not true! First consider that in the case involved, the piece was marked with the copyright symbol, so Trifari was obviously already marking pieces at some point before the case went to court. And, back to the discussion of Hollycraft jewelry, we know for a fact that that company’s jewelry was being marked with a copyright symbol (copr.) as early as 1950. A third known example is Florenza, as Dan Kasoff used this mark in the early 1950’s and also had several successful lawsuits shortly on the heels of the Trifari one. So we know with certainty that copyright symbols were being used by at least some manufacturers and designers as early as 1950. To add to the dating confusion, trademark protection was also secured for many brand names and rather than using the “TM” or ® marks, some of these companies used the © instead with the trademarked name. Again, Florenza is a good example of such a company. And of course, hang tags were sometimes used instead of placing a mark on the jewelry itself. This is true even today. Is your head spinning yet? So the second point that I’d like to make is that a copyright symbol or lack thereof is not conclusive evidence for dating any piece of vintage costume jewelry. Can it be an indication of dating? Sure it can, especially if you know a bit about the background of the company including years of operation and their general practice as to marking their products. Did the widespread use of copyright symbols on jewelry stop the jewel thieves from stealing other company’s designs? Well, yes and no. If the designing company had the resources to sue, and also the financial incentive to make the effort, then the copyright symbol certainly won cases for manufacturers. However, some cases were lost on the basis that the design was not unique enough to be afforded copyright protection. And, as is still true today, if you can’t afford to sue or have little to gain even if winning a copyright suit, then it just isn’t going to happen. That said, the copyright mark would likely make potential copycats think twice about the consequences of design theft.